McLean, VA – June 20, 2018 – CORAS, a pioneer in Work Management since 2003, announces the enhancements to its powerful map capabilities. With its CORAS June18.1 Release, users can export and import maps with the new Map Share feature. Maps are an integral part of CORAS’ business agility solution, providing the ability to repeat, reuse, and re-purpose groups of work items to accelerate start times, reinforce standards and best practices, and more. Mind maps bring significant value to individual and team projects for their visual power to facilitate organization and planning. They are proven to increase group participation and collective understanding. “The CORAS Customer Success Team mission is to help users find or define the maps that are right for their organization. We offer complimentary sessions, which usually take less than 30 minutes, to guide them on the process of accessing, building, and sharing maps” said James Smith, Customer Success Manager. These sessions are performed either over the phone or through one-on-one sit-downs. As the leader in business agility, CORAS is disrupting business-as-usual by creating a solution that takes the place of multiple software programs and combinations. 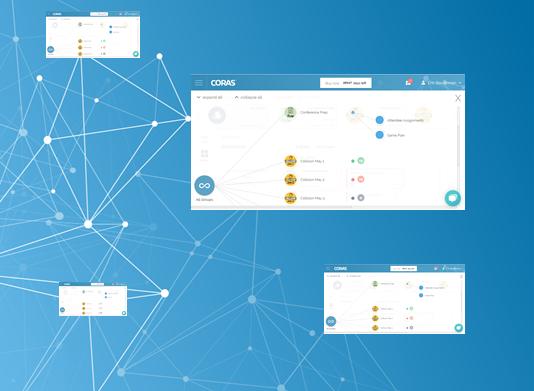 Working independently or in tandem with clients’ existing programs, CORAS provides aggregated data, iterative processes, reporting, mind maps, apps, and transparency throughout users’ organizations. CORAS offers solutions in mid-market and enterprise level companies, including a flexible foundation for running your business; giving managers, project managers, and other stakeholders the tools they need to effectively manage their projects. This core work management functionality is supported by a wealth of other key features, including BI/Analytics and Process Improvement. To learn more about CORAS, visit us at Coras.com or contact (703) 797 1881 #41.